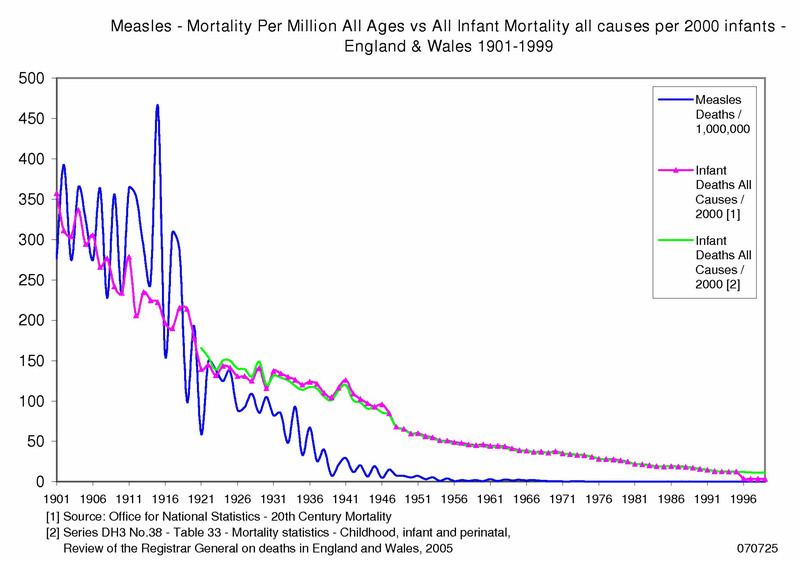 The Measles mortality graphs are enlightening [more below] and contradict the claims of Government health officials that vaccines have saved millions of lives. It is an unscientific claim which the data show is untrue. Here you will also learn why vaccinations like mumps and rubella for children are medically unethical and can expose medical professionals to liability for criminal proceedings and civil damages for administering them. The success of the City of Leicester, England was remarkable in reducing smallpox mortality substantially compared to the rest of England and other countries by abandoning vaccination between 1882 and 1908 [see more below]. This contrasts how the drug industry has turned each child in the world into a human pin-cushion profit centre. The financial markets have known for 20 years and more the pharmaceutical industry’s blockbuster patented drugs business model would eventualy fail We now see the Bill Gates’ type business model emerging – almost everyone has Windows software on their PC – almost everyone will be vax’ed. Gates quickly became a multi-billionaire. With vastly more people to vaccinate than computers requiring software the lure of money is many times greater. All this whilst we watch as childhood prevalence of asthma, allergies, autism, diabetes and more have increased exponentially as the vaccines have been introduced. For the same reason vaccines do not “work” and “save” lives in impoverished African and other third world economies. The majority of third world child deaths still occur despite vaccination. These children need proper food, clean water to drink and wash in and sanitation. We give them vaccines instead. Table 21. 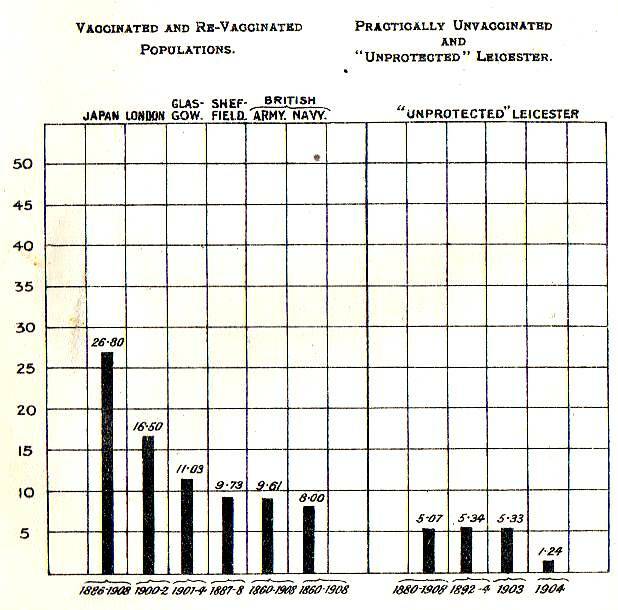 – Smallpox Fatality Rates Compared with “Unprotected” Leicester – 1860 to 1908. [ED Note 15 Oct 2009: As information like that here has become available health officials are changing from scaremongering parents into vaccinating with claims their child could die. Now they claim vaccinating reduces the numbers of cases of disease [ie. instead of deaths] and produce graphs of dramatic falls in reported cases (instead of deaths) when measles vaccine was introduced. This is again misleading. A dramatic fall in the numbers of reported measles cases would be expected. Doctors substantially overdiagnose measles cases especially when they believe it is a possible diagnosis. Doctors were told the vaccine prevented children getting measles when introduced in the late 1960′s so after that time a substantial reduction in diagnoses would be expected. Examples of recent overdiagnoses of measles when there are measles “scares” are proportionately up to 74 times (or 7400% overdiagnosed). Figures and sources follow the next paragraph. What health officials are also doing is relying on very old and unreliable data which ignores that measles has become progressively milder so the risks of long term injury have diminished – (and death is the most extreme form of long term injury – shown here by official data to have diminished rapidly and substantially over the past 100 years without the risks posed to children’s health by vaccines). To start you with something simple, Scurvy, Typhoid and Scarlet Fever are good examples to use as comparisons with “vaccinatable” diseases. Medicine and especially drugs and vaccines played no part in the fall in Scurvy death rates and the same can be seen for other diseases. Scurvy is a condition caused by a lack of vitamin C. Poor nutrition, particularly a lack of fresh fruit and vegetables, can result in Scurvy. Mortality rates fell dramatically as living conditions improved. Typhoid and Scarlet Fever vanished without vaccines but with clean water, better nutrition, sanitation and living conditions. Note that what seem large fluctuations after MMR vaccination was introduced in 1988 are not so large and are a feature of plotting the graph on a logarithmic scale. This can be seen in the following graph, plotted on an analog scale. The graph below is from a peer refereed medical paper: Englehandt SF, Halsey NA, Eddins DL, Hinman AR. Measles mortality in the United States 1971-1975. Am J Public Health 1980;70:1166–1169. The red dotted trendline has been added. 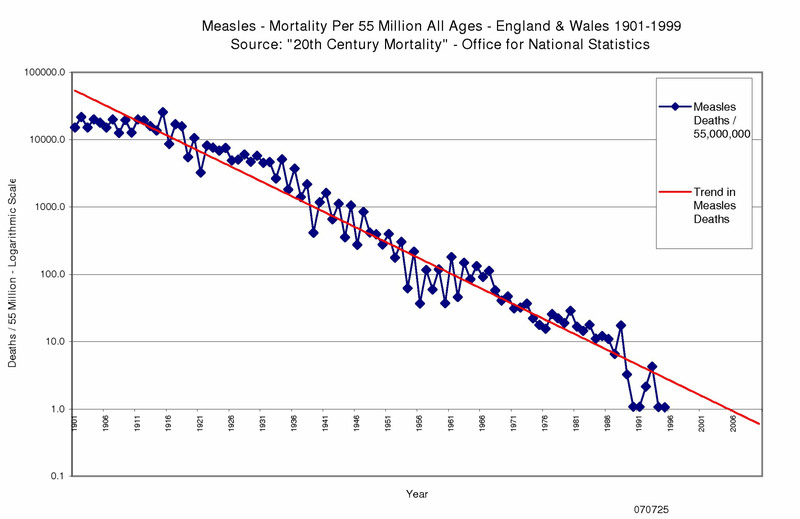 This shows US measles mortality was falling regardless of whether vaccination was used. By 2010 overall measles mortality in the USA was to fall to around 1 in 25 million without vaccines. As the severity of measles declined, long term complications would also. Whilst people still caught measles it was not the dreaded disease we are told it is today. USA Measles Mortality 1912 to 1975 [Source: Measles mortality in the United States 1971-1975. 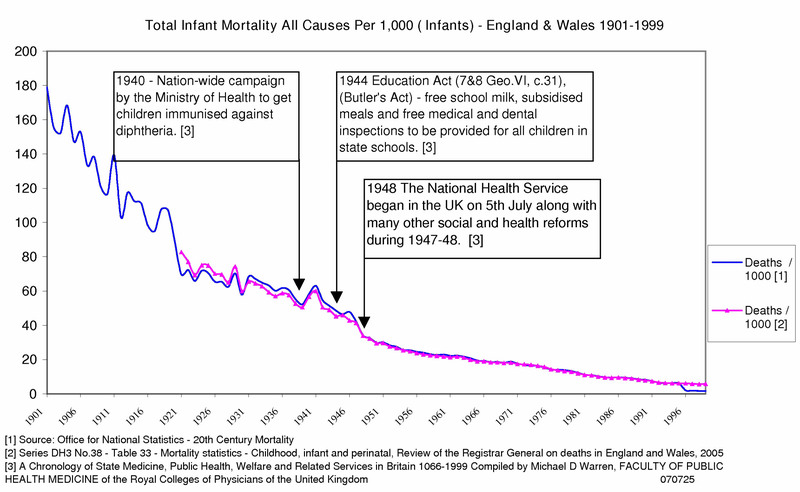 Halsey et al, Am J Public Health 1980;70:1166–1169. Correspondingly, when vaccination was introduced, they will tend to follow the fashion of not diagnosing measles, where they believe it controlled by vaccination. This following of fashions has been seen in other areas, including Coroner diagnoses of causes of death. It is not exaggeration but accurate to state that mumps vaccination takes the medical profession firmly into the territory of the criminal law and unethical medical treatment of children. "there was no need to introduce routine vaccination against mumps" because "complications from the disease were rare" JCVI minutes 11 Dec 1974. 1 in 4 males who has achieved puberty and has not achieved immunity to mumps runs the risk of orchitis. Orchitis (usually unilateral) has been reported as a complication in 20-30% of clinical mumps cases in postpubertal males. Some testicular atrophy occurs in about 35% of cases of mumps orchitis: Mumps - Emedicine. This means one of the male testicles shrivels up. Affected men can become sterile in one testicle. This affects one in every nine males who catch mumps after puberty compared with none who catch it before puberty. It is only because most men have two testicles and only one is affected that total sterility is rare. Most men would find that little consolation. Having a shrivelled testicle would carry psychological and practical consequences for any intimate physical relationship in adult life. The message seems to be it is better for a child to catch mumps naturally before puberty. As with mumps, rubella vaccination again takes the medical profession into the territory of the criminal law and unethical treatment of children. A graph for rubella mortality is not included because death from rubella over the last century was so rare the figures are insufficient to plot a graph of any note. Aside from a rash the adverse effects of rubella for children are minimal. Vaccination against rubella is of no clinical benefit to a child particularly when compared to the risks of adverse vaccine reactions. If a pregnant woman catches rubella infection during the first three months of pregnancy and the child survives, this poses a risk to the unborn child of being born with congenital rubella syndrome (CRS), involving multiple congenital abnormalities. Prior to the introduction of rubella vaccine, the number of annual cases in the UK was small, around 50 per annum. Additionally, 92% of rubella cases deliver normal healthy children: DANISH MEDICAL BULLETIN MARCH 1987 - WAVES Vol. 11 No. 4 p. 21 .This small risk can also be reduced either by making sure all women have caught rubella as children or by vaccinating those who have not prior to puberty. This minimises the exposure of children to the vaccine and hence to unnecessary risks of adverse vaccine reactions. 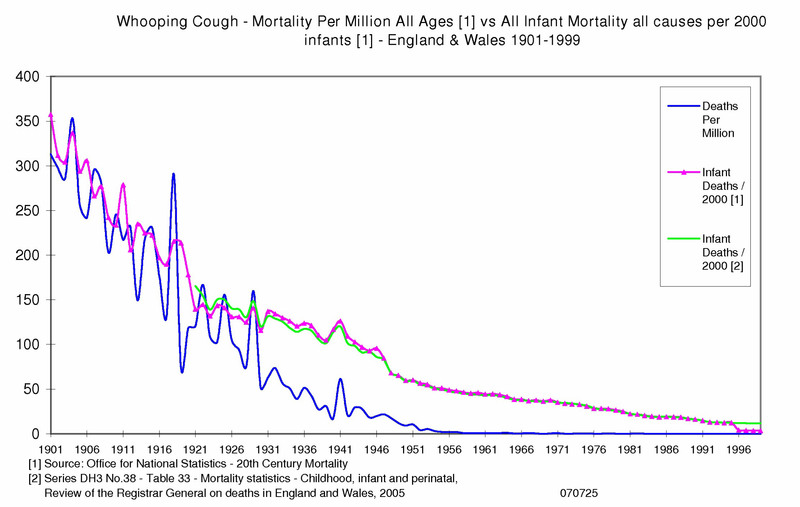 The following is the same USA graph as just above, but with Influenza and Tuberculosis Deaths included. And you can see that Influenza deaths were not prevented by a vaccine – because for most of the period covered, there was no vaccine available at all and when it became available, it was not freely available until the present day – when guess what – ‘flu mortality had already plummeted – and guess what else – it does not work particularly well either – in fact so badly it may well be best avoided. 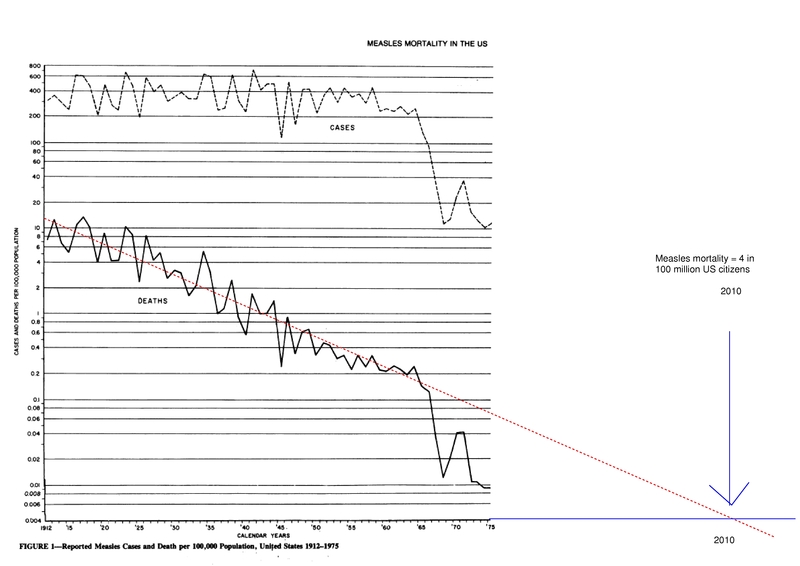 The following is the same graph as above but showing the full curve for influenza and pneumonia mortality. 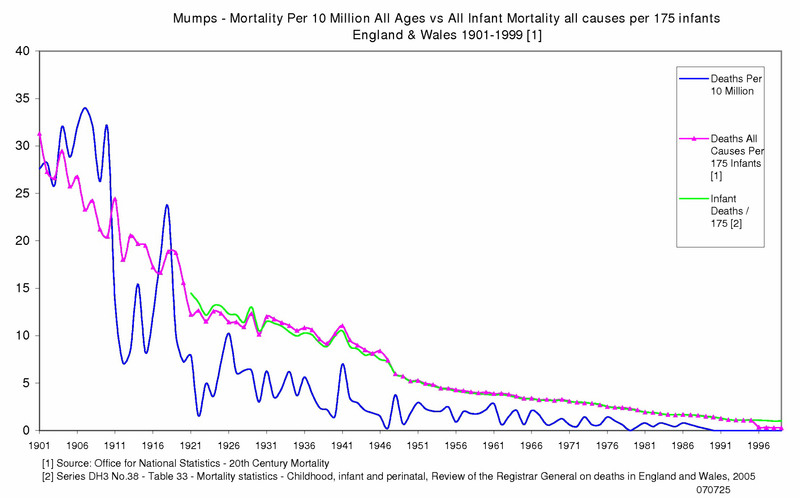 Here we see Diphtheria mortality falling all by itself. In the UK, although the vaccine was introduced in 1940, most children particularly under 5 did not get it and there was a large catch-up campaign in 1945-6. The under 5 age group are the most at risk from infectious disease. 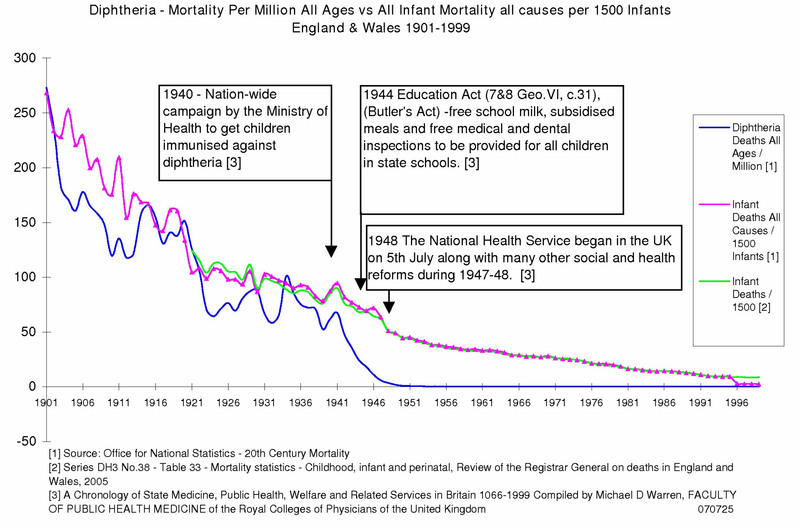 But can you see any difference in the rate of fall of mortality from Diphtheria after 1946 in the UK? No? Surprised? The “success” of diphtheria vaccine is another unscientific quasi religious faith of the medical professions which is not backed up by scientific data. Diphtheria vaccine was introduced to the UK in 1940. It is certain beyond doubt that diptheria vaccine played no part in the sudden fall in diphtheria mortality from 1941 to 1946 [see graph] . The records show most children went unvaccinated until after the major fall. The graph of total infant mortality as a benchmark also shows the vaccine made no discernible difference to diphtheria mortality at any other time. “about 36 percent of school age children had been immunised but only about 19 percent of the younger children“: British Journal of Nursing October 1948 p121. It was not until 1946-7 – after the substantial fall in diphtheria mortality had taken place that a major effort was made to vaccinate the children who had been missed. 969,000 children under 5 were “immunised”: British Journal of Nursing October 1948 p121. With an annual birth rate in the region of 200,000 that represented most of the children born during 1941 to 1946. So diphtheria vaccination could not have been responsible for the fall. But we can identify what was most likely responsible. We can see the impact of the social health and welfare reforms of 1944, 1947 and 1948. Free school milk provided, among other nourishment, vitamin A to help children’s immune systems fight disease. It is vitamin A which the World Health Organisation is keen to provide to third world children now for the same reason. 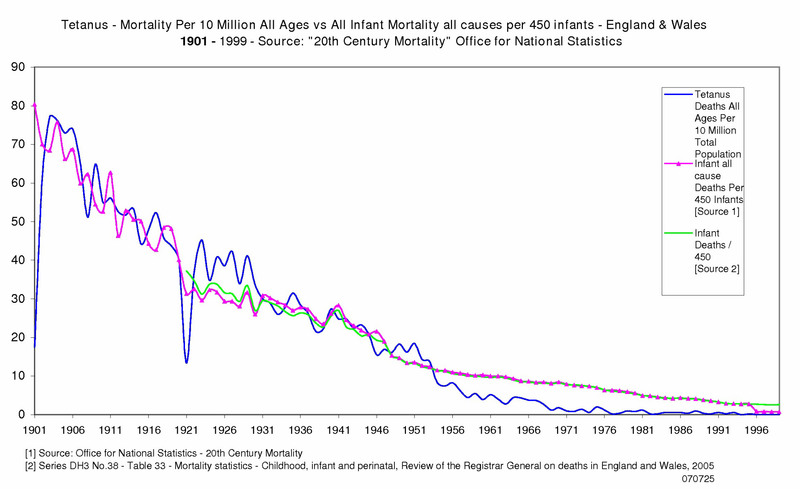 It can be seen that the benchmark decline in general infant mortality (ie. all causes of infant death) closely follows the decline in diphtheria mortality in the general population. This again demonstrates that the decline in diphtheria mortality was part of a general trend and had little or nothing to do with the introduction of vaccination. This graph demonstrates that the administration of tetanus vaccine is likely to be pointless and puts children especially at risk of adverse reactions to the vaccines. Fewer agricultural workers coupled with better access to healthcare would result in better treatment of wounds. Tetanus thrives in deep wounds which are not properly cleansed. So by having fewer agricultural workers and better wound care could reduce the incidence of tetanus cases. So if the reduction in tetanus mortality in the 1950s is anything other than part of the continuing decline with better standards of living, those two reasons are the most likely explanations. In the graphs notice the large numbers of deaths caused by the smallpox vaccine itself. By 1901 in the UK, more people died from the smallpox vaccination than from smallpox itself. The severity of the disease dimished with improved living standards and was not vanquished by vaccination, as the medical "consensus" view tells us. Any vaccine which takes 100 years to "work" is not. On any scientific analysis of the history and data, crediting smallpox vaccine for the decline in smallpox appears misplaced. When during 1880-1908 the City of Leicester in England stopped vaccination compared to the rest of the UK and elsewhere, its survival rates soared and smallpox death rates plummetted [see table below]. Leicester’s approach also cost far less. Ron: There are about 157 comments attached to this article. The editor's responses to criticisms are worth a read if you are seriously interersted in this subject.